Swivel clamps are an important part of the old vises that often end up needing attention. Some of the older Bullet vises had swivel clamps that were built out of hex stock, so I decided to try my luck at building some of these. I chose to use just CRS for the hex part of the body. 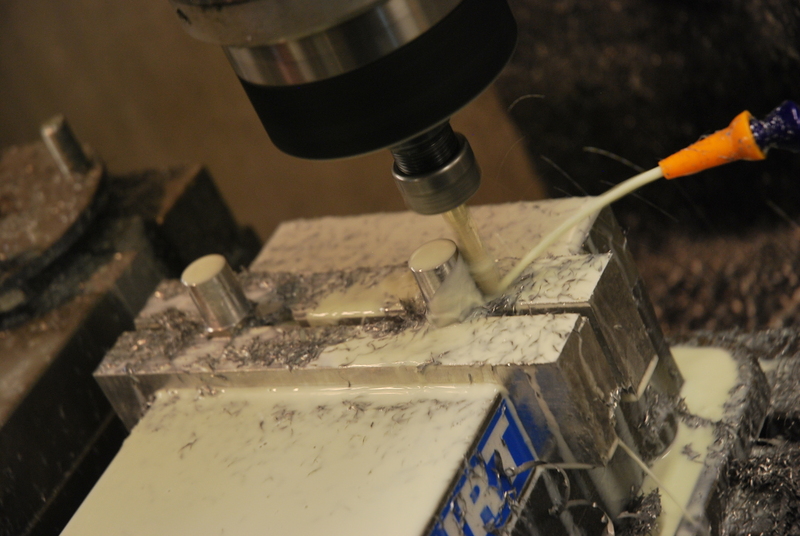 I built a set of aluminum jaws for my Kurt machine vise with the 3/4 and 7/8 hex machined into the jaws. I can clamp two at a time to machine the round part above the hex. The 3/4 hex body is 1-3/8 tall while the 7/8 are 1-5/8 tall. 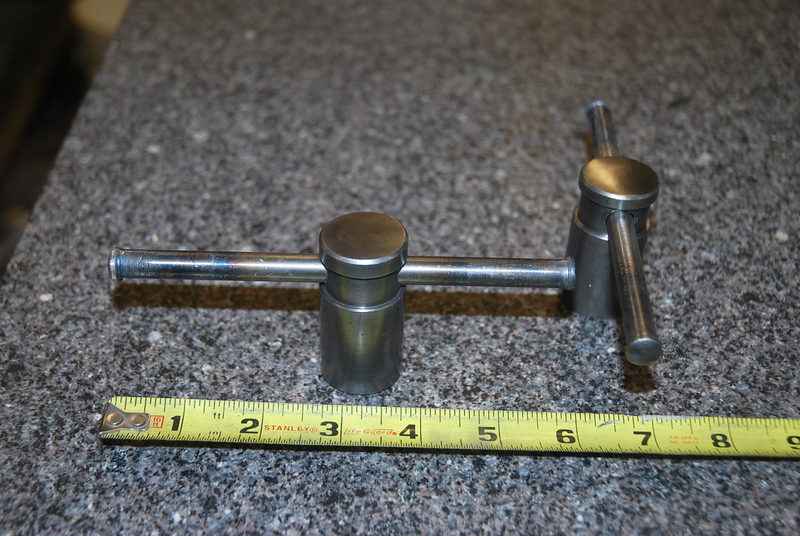 Handles are prone to bend and often end up taking abuse from all you hammer and extension pipe guys, so replacing them with steel that is stronger than the original is a good way to increase an old vise’s lifespan. I use 1144 CRS steel, that is a modified SAE 1144 steel which is semi-hard and very strong. 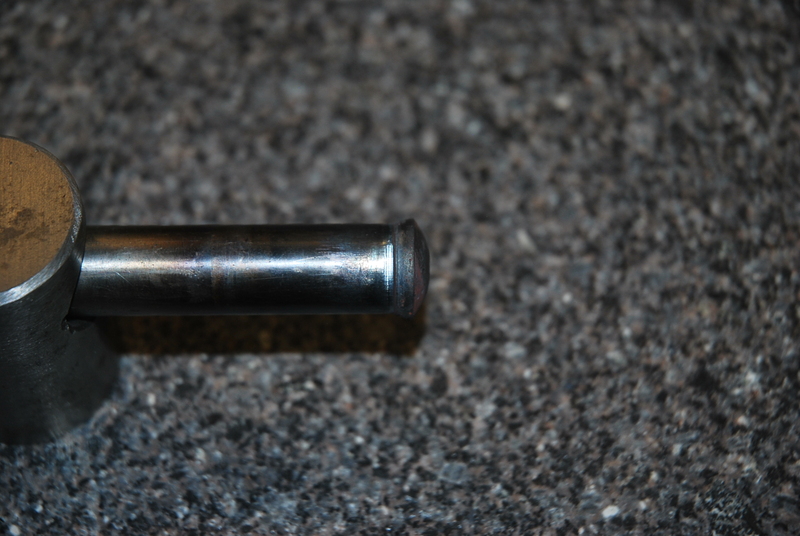 This steel is a higher-strength alloy than 1018. Click here to read more about this steel. 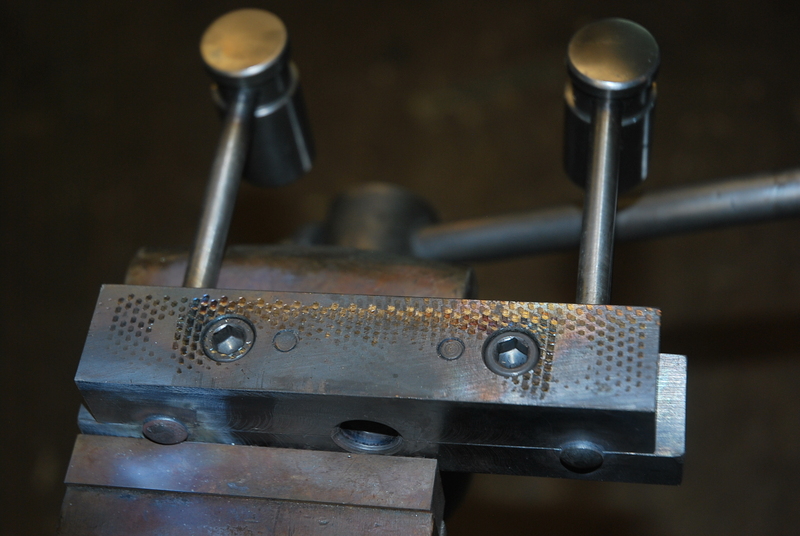 Then I build a clamp setup (in the pic, underneath the radius punches) out of P-20 Mold steel and give the handle material about .007-.012 of pinch, the two steel pieces are pinned and bolted together, then drilled and reamed to size in the two halves on center. I then machine off the pinched amount on the mating faces. What you can’t see in the pictures is that I leave the handle material about 5/16 above clamp fixture and squeeze it tight in the vise. 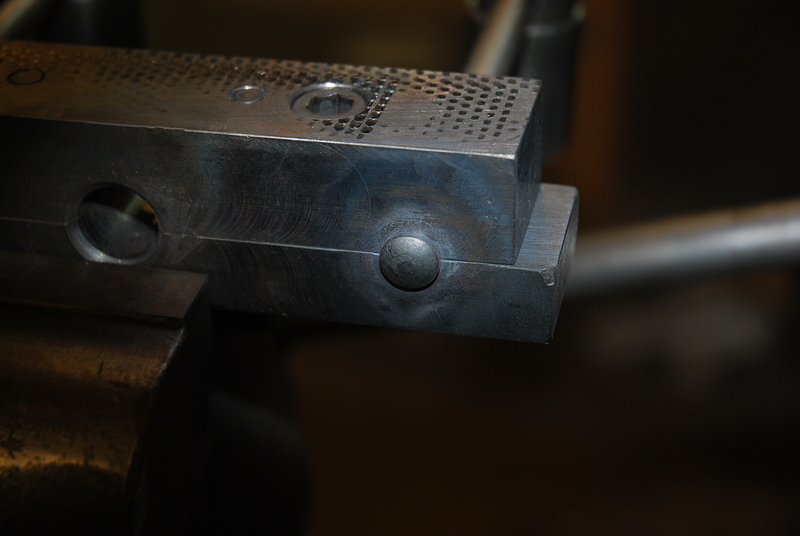 I heat it till it is cherry red before using another piece of P-20 tool steel that has a radius cut in the end like a punch. I use three radius sizes so far for different handle sizes, 1/4, 3/8 an 1/2 R. It takes me no more then three times heating the handle ends cherry red and hammering the end radius on the swivel handles till I reach a set dimension normally at least 1/16 larger then the shaft diameter. It does take more then three times with heat and pinching doing handles over 3/8 in diameter. I have figured out through experience what is important. How hard to hit, keeping the punch perpendicular, and when to stop so the ends are a uniform size. 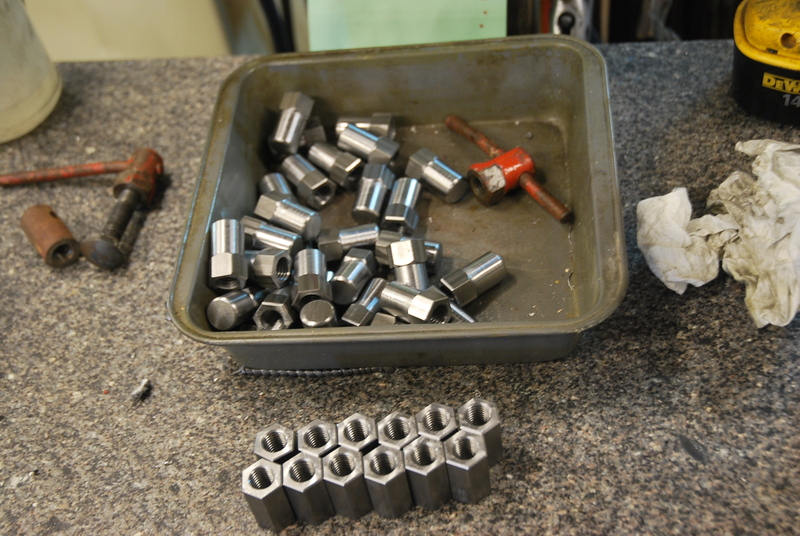 Having the proper jigs, a good strong vise to hold them, the right size hammer, and a lot of practice is all you need. Note the swivel clamps below for a large Reed vise. 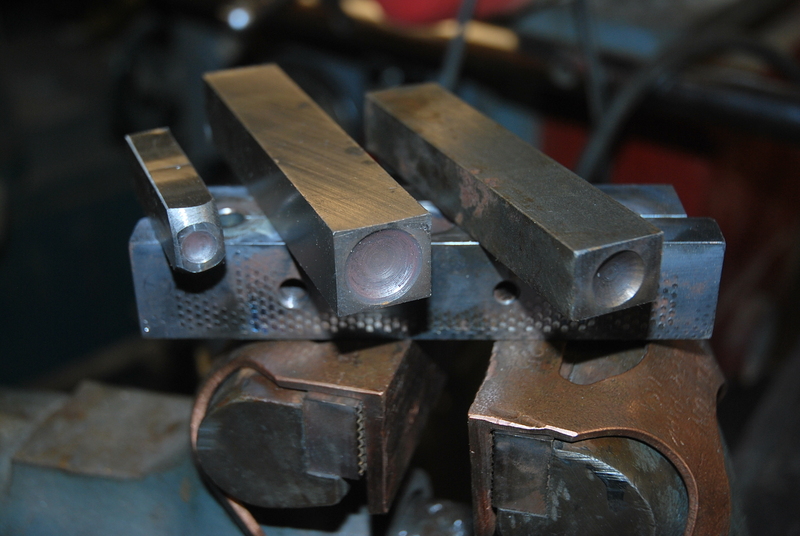 This method can support many different types of swivel clamps out there. If you want to purchase some of the ones I make then select this link. 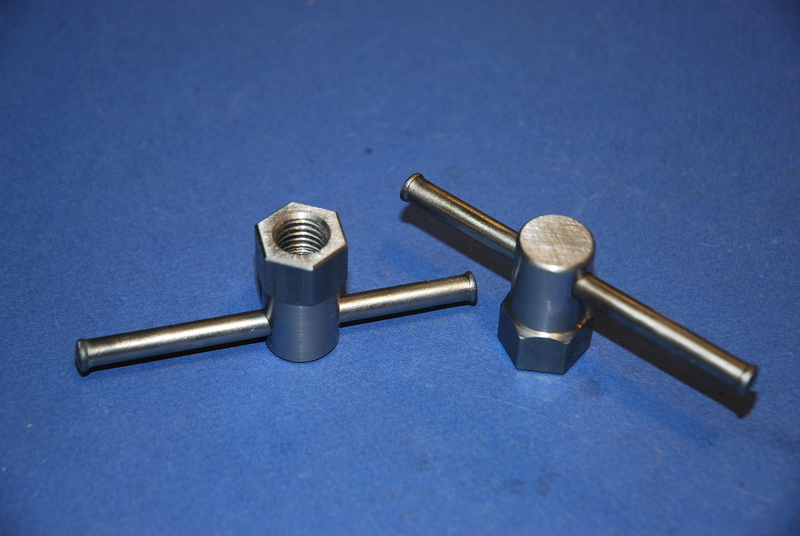 Wilton Swivel Clamps.